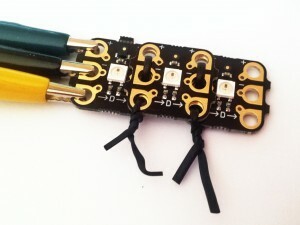 I’ve been playing with the amazing Crumble controller from Redfern Electronics. It comes with full colour LED lights called Sparkles which are really easy to attach using croc clips, and you program it using a Scratch-like interface – so it’s really quick to get going. Here I’ve used a single large variable, x which constantly grows, and because of integer overflow once it gets to 32,000 ish it ‘wraps’ around to -32,000. I use z to remember which sparkle in the chain we are updating. Then u, v and w are the RBG values, offset from each other so as one is high another is low, this gives the changing colours. The multiply by 128 or -128 gives us an absolute value between 0 and 255 to set the sparkle R G or B strength. A little delay to control the speed and there you are! Oh, also I got all in a tangle chaining sparkles together, so my quick temporary fix was to use cable ties to press them together. It was really tidy and didn’t use up tonnes of croc clips!